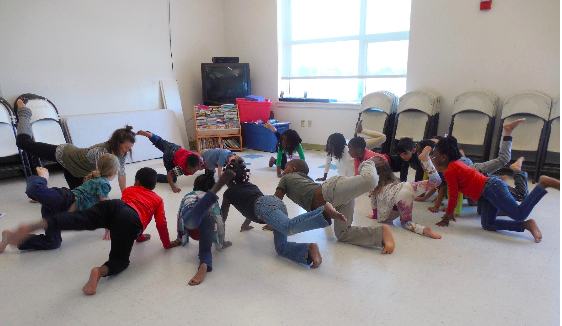 Congratulations to Central School in South Berwick and Mabel I Wilson School in Cumberland, recipient of dance education grants for the 2019-20 school year. Central School music educator Kate Smith and physical education teacher Kristan Tiede will work with Teaching Artists Hunt and Allison Smith to introduce 489 grades PK-3 to traditional-style set dances. 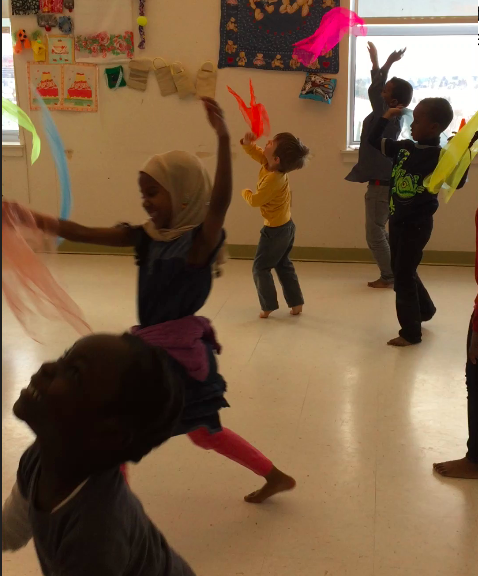 Students in the ten kindergarten classes at the Mabel I Wilson School will have the opportunity to receive instruction from Teaching Artist and dancer Elly Lovin to learn movement and creative dance education. The funding for this grant is provided by a group of dance studios and two high schools with dance education programs. Each year on a Friday night in November a fund raiser is held to raise the funds. This is the only grass-roots funding program that the Commission has in place. Thank you to all of these amazing dance instructors and students who are committed to this effort. To date they provided over $21,000 and hundreds of Maine students have benefited. To learn more about about the dance education grant and the Maine Arts Commission other arts education funding opportunities please go to MACs Arts Education funding page. Lynda Leonas has been a Maine Arts Leadership Initiative (MALI) Teacher Leader since 2015, Phase 5. It was great to hear about her work at Walton School that is connecting her students with others. 5th grade students from Mrs. Breau’s class at Walton School in Auburn, Maine, began a trial practice run of the painting pen pal program on November 8 during a 30-minute art class with their art teacher, Lynda Leonas. Each student inspired personal responses and program feedback from music and art educators, teaching artists, and members of the Maine Arts Commission during the November MALI Critical Friends Day at the Viles House in Augusta. Students were thrilled with the responses they received and hope to meet their practice partners one day! Elementary schools in Androscoggin and Cumberland Counties will participate in a larger practice run of this peer student painting exchange this coming spring. We hope to define and direct any technical adjustments necessary in creating a simple large scale painting pen pal exchange and exhibit for teachers and students within the State of Maine. Each grade 5 student will create a painting within an open choice painting studio environment. The painting will be exchanged with a student in another school district. Each participant will reflect upon key ideas and emotions expressed within the art work they receive and respond with his/her own personal interpretation to create visual conversations! Students and teachers will expand their communities without leaving their classroom throughout the Painting Pen Pals process. Students will access and upload paintings, reflections, and literary responses in the form of poetry into a WIKI site creating an online exhibit while art and classroom teachers upload formative assessments, enrichment activities, and their own painting pen pal works! Our goal is for all peer partnerships to meet in person at a culminating exhibit of their completed works. 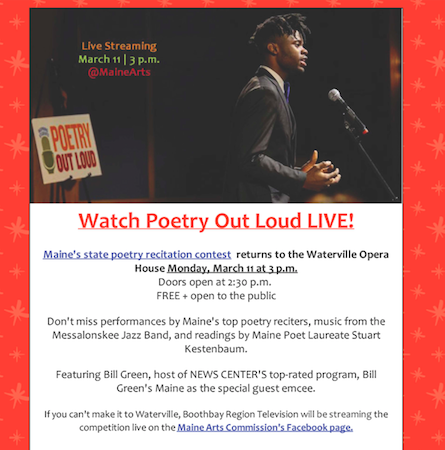 Be sure to check out Bill Green’s Maine tonight at 7 p.m. Bill Green will be airing a special Maine Poetry Out Loud edition on WCSH TV (Channel 6) in Portland and WLBZ (Channel 2) in Bangor at 7 p.m. March 30! AUGUSTA, ME—The Maine Arts Commission is seeking nominations for the 2nd Annual Maine Arts Awards, honoring citizens, organizations, communities, and businesses for their significant impact on arts and culture in Maine. The nomination deadline is Monday, April 1. Nominations may be made in one of seven categories:Artist; Business (large > 50 employees and small < 50 employees); Arts Education; Community; Rural Organization; and Philanthropist. Any Maine citizen, organization, business, school, or community may be a Maine Arts Awards nominee. Accomplishments of a nominee should reflect substantial contributions made in Maine that exemplify a long-term commitment to the arts. The finalists will be honored in a celebration highlighting their work in the fall of 2019, at which the recipients will also receive a work of art commissioned especially for these awards. For more information about the Maine Arts Awards visit wwww.MaineArts.com or contact Executive Director Julie Richard at julie.richard@maine.gov or 207-287-2710. 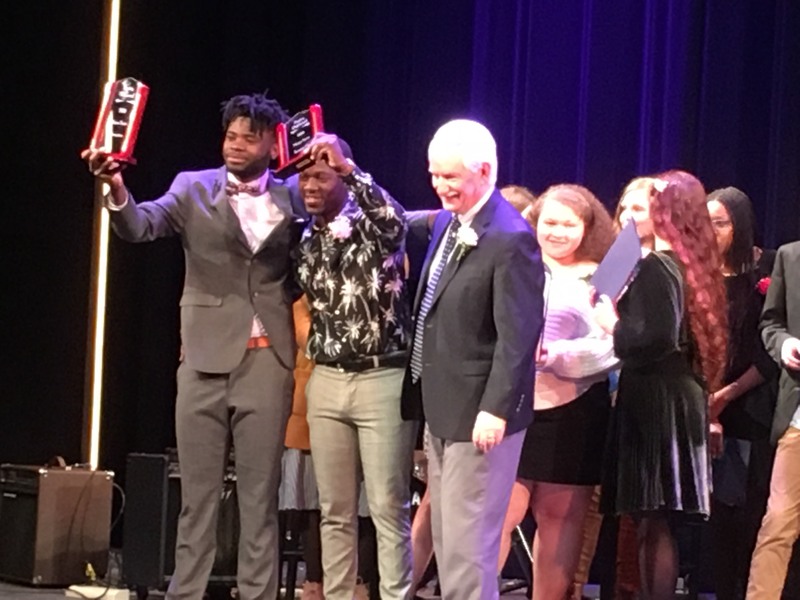 Check out the 2019 Maine State Poetry Out Loud Champion reciting and the end of the state finals when Joao was announced as the champ on the Maine Arts Commission Facebook page. Joao on the news on WGME TV, listen to how inspired he was by last year’s champion Allan Monga. Ten students with all kinds of emotions arrived at the Waterville Opera House yesterday afternoon at about 12:30. 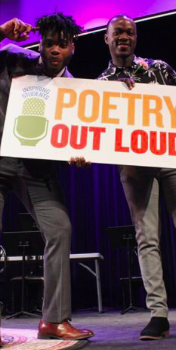 At 2:30 the doors opened to the public and about 100 people – teachers, parents, grandparents, siblings, friends, and poets flowed into the seats for an afternoon of poetry. Everyone was excited for the State Poetry Out Loud Finals. The students were prepared, they looked great and one by one they walked onto the stage to recite poems that they had become very familiar with during the last few months. At the end of the day, the ten students stood shoulder to shoulder, proud for their amazing accomplishments. One was named the 2019 Maine State POL Champion and one became the runner-up for Maine. 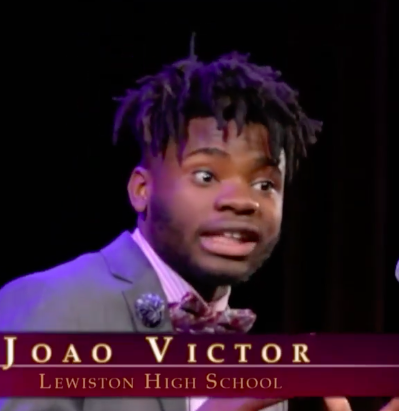 Congratulations to Joao Victor, grade 12, Lewiston High School, Maine’s Champ. Joao will represent Maine at the National POL Finals. 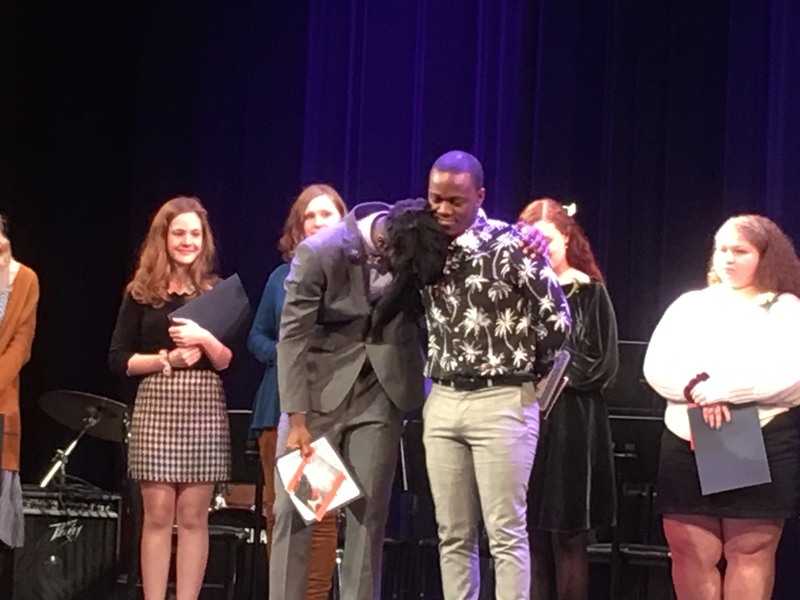 Congratulations to Allan Monga, grade 12, Deering High School who was named the runner-up. I invite you all to watch the live-stream of the national event on April 29 and May 1. More details will be provided in the future on this blog. 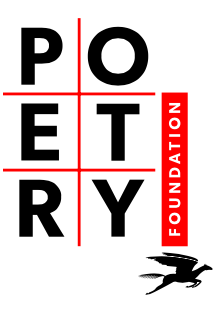 Waterville Opera House – March 11 – doors open 2:30 p.m.
Monday, March 11 at 3 p.m.
Don’t miss recitations by Maine’s top poetry high school student reciters! Performance by the Messalonskee Jazz Band under the direction of music educator Andrew Forster, beginning at 2:45 p.m. If you can’t make it to Waterville, Boothbay Region Television will be streaming the competition live on the Maine Arts Commission’s Facebook page.